I would like to update you on several exciting town projects that are underway or have recently been completed. We are very proud to open, this month, a beautiful new park on Skull Creek that provides water access for non-motorized water craft (kayaks, rowing, sailing, paddle boarding, wind surfing, etc. ), as well as fishing and crabbing. The Rowing and Sailing Center at Squire Pope Community Park, located on the site of the old seafood co-op at 133 Squire Pope Road, cost just under $1.2 million to construct. This park includes parking areas, restrooms, a picnic pavilion, playground, fire pit, swings, benches, and two fenced, gravel storage areas, along with a fixed timber pier, aluminum gangway, and floating dock. You may contact the Island Recreation Center for information on the water craft programs they will run out of this facility. Another beautiful waterfront park opening this winter is the new Shelter Cove Community Park. It replaces the former park and will contain the same amenities and Lowcountry style, but with an added performance pavilion. This project is being funded and constructed by the mall developer as part of a development agreement. As part of our ever-expanding pathway network, we have recently completed construction of two new pathways along Pembroke and Gardner Drives. This adds another mile and a half of pathways, which connect several mid-island residential and commercial developments to the Leg O Mutton Road and William Hilton Parkway pathways. In January, construction will begin on a new pathway along eastbound William Hilton Parkway (US 278 Business), from the new traffic signal at Leamington to Shelter Cove Lane. It will connect to a new pathway in front of the mall that was privately funded and constructed as part of a development agreement, totaling another mile and a half of new pathways to be finished this spring. Each year in October, our local citizens and others come together at the annual Historic Bluffton Arts and Seafood Festival in Old Town. The festival is a week-long event that offers a myriad of activities and showcases our locally harvested seafood, delicious Lowcountry cuisine, and our rich history and culture that revolves around our waterways, especially the May River. The event highlights all of the reasons that we need to continue our best efforts to protect this most valuable natural resource. That’s why Town Council celebrated the week of October 15 as “Water Quality Awareness Week” in Bluffton. A town proclamation was created to encourage our local citizens to take action and conserve our local waterways and shorelines. In addition, this proclamation highlighted the town’s continuing efforts to educate our students and citizens regarding these resources. 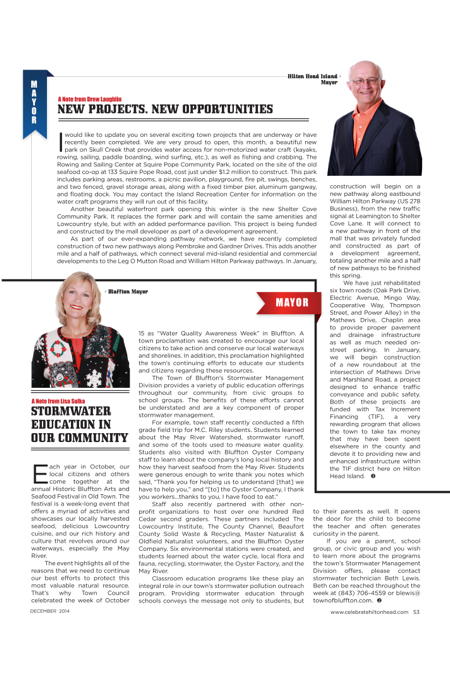 The Town of Bluffton’s Stormwater Management Division provides a variety of public education offerings throughout our community, from civic groups to school groups. The benefits of these efforts cannot be understated and are a key component of proper stormwater management. Staff also recently partnered with other non-profit organizations to host over one hundred Red Cedar second graders. These partners included The Lowcountry Institute, The County Channel, Beaufort County Solid Waste & Recycling, Master Naturalist & Oldfield Naturalist volunteers, and the Bluffton Oyster Company. Six environmental stations were created, and students learned about the water cycle, local flora and fauna, recycling, stormwater, the Oyster Factory, and the May River. Classroom education programs like these play an integral role in our town’s stormwater pollution outreach program. Providing stormwater education through schools conveys the message not only to students, but to their parents as well. It opens the door for the child to become the teacher and often generates curiosity in the parent.